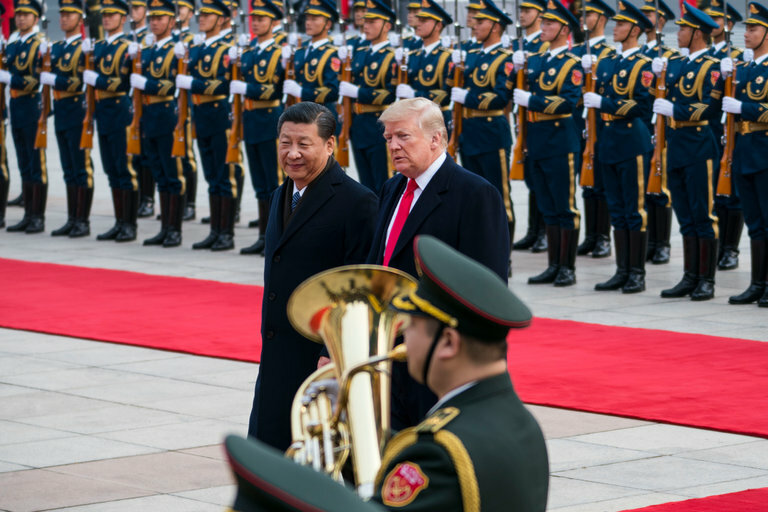 President Xi Jinping of China with President Trump in Beijing in November. BOAO, China — President Trump has cajoled China on Twitter. He has threatened to impose tariffs on $150 billion of Chinese imports. He predicted China would back down. On Tuesday, China’s leader, Xi Jinping, offered his counterargument: China is a safe and reliable partner. The implication: The United States is not. Speaking publicly on Tuesday for the first time since the beginning of an escalating trade dispute between his country and the United States, Mr. Xi implicitly took aim at the Trump administration, saying, “We must refrain from seeking dominance” by rejecting “power politics.” And he pledged to rebuff efforts to impose barriers to world trade. “China’s door of opening up will not be closed and will only open up even wider,” he said, pledging to open up his country’s financial and insurance sectors. The speech, delivered at the Boao Forum for Asia in China’s southern island province of Hainan, is the latest effort by China to position itself as an advocate of free trade and reliable growth. That pitch runs counter to China’s longstanding reputation as a country that has been accused of violating trade rules and intellectual property rights. It also comes as Mr. Xi tightens his grip over his country’s political, social and economic life. But in a time when the United States’ policies have raised called into question the stability of the world order, China’s growing confidence and its verbal support of global trade rules offers other countries a potentially appealing alternative to Mr. Trump’s rhetoric.